In this reinvention of Sadako and the Thousand Paper Cranes, images by Caldecott medalist Ed Young and new text by Eleanor Coerr come together to inspire children of all ages. In her novel Sadako and the Thousand Paper Cranes, Eleanor Coerr told the moving story of Sadako and her brave struggle against leukemia, the “atom-bomb disease,” which she developed when she was twelve, just ten years after the bomb was dropped on Hiroshima. 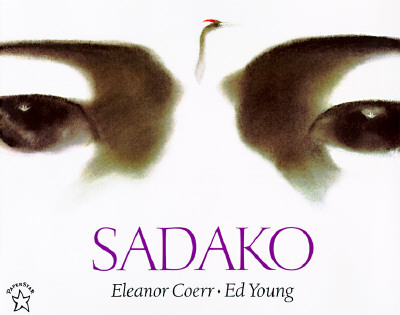 The novel became a classic, and when Sadako’s story was to be made into a film, Caldecott medalist Ed Young was asked to do the illustrations. With love and commitment, he created nearly 300 hauntingly beautiful pastels which bring to life the spirit of Sadako, her courage and her strength. Eleanor Coerr was born in Kamsack, Saskatchewan, Canada, and grew up in Saskatoon. Two of her favorite childhood hobbies were reading and making up stories. Her powerful novel, Sadako and the Thousand Paper Cranes, has been translated into many languages and has moved both children and adults to write plays, perform ballets, compose songs, and collect money for peace statues—all celebrating Sadako and her wish for peace. Eleanor has visited schools all around the world encouraging her audiences to work for a nonviolent world. Folded cranes are everywhere, and always underneath the statue of Sadako in Hiroshima's Peace Park. Caldecott medalist Ed Young (edyoungart.com) was born in Tientsin, China, and brought up in Shanghai. He cites the philosophy of Chinese painting as an inspiration for much of his work. Mr. Young has been illustrating children's books for more than twenty years and has won many awards. He received the 1990 Caldecott Medal for his book Lon Po Po, and his much-lauded collaboration with anthologist Nancy Larrick, Cats Are Cats, was named one of the Ten Best Illustrated Books of 1988 by The New York Times. Mr. Young studied at the University of Illinois, the Art Center of Los Angeles, and Pratt Institute in New York City. He and his family live in Hastings-on-Hudson, New York.